Often a pet is surrendered because an owner feels they have no other choice or is unaware of resources that can keep their pet in their home. We may be able to help you find alternatives to surrendering your beloved pet. 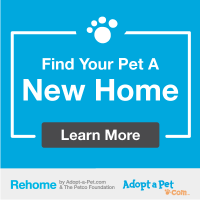 Download the re-homing tool kit, full of resources to help you find a new home for your pet. Don’t rush! Take time to find your furry friend the best new home. Increase your pet’s adoptability by having them spayed/neutered, groomed, and up-to-date on vaccinations. Tell your friends, family, and coworkers. The more people that know you need help, the better the chance you’ll have. Sometimes, individuals find it necessary to surrender their pets due to unexpected life changes or unforeseen circumstances. We understand that this is a difficult decision to make, and can help your pet find a new home. MSRPAC is able to accept owner-relinquished animals only; any lost/stray animals must be brought to your local county animal services. Pet admissions are accepted by appointment only. To schedule a pet admission appointment, please fill in the form below and someone will contact you to schedule an appointment. The admissions process will take 1 hour. Our Intake Team performs a behavior assessment on every dog and puppy to determine their temperament. If the dog being surrendered fails our assessment, we will not be able to admit them into our care and will provide you with alternate suggestions. The admissions process will take 1 hour. Please bring your cat in a carrier if possible, however, we do not accept surrenders of cats or kittens in traps. We do not admit feral cats or feral kittens. For information on our feral cat TNR program, click here. All cats must pass a Feline Leukemia and Feline Immunodeficiency Virus test to be admitted into our facility. What is Admissions by Appointment? Admissions by Appointment is an industry-leading admissions program designed to give every pet surrendered to the Mary S Roberts Pet Adoption Center (MSRPAC) its best chance for success by way of a simple, 30-minute intake appointment. Admissions by Appointment marks an end to long lines, long wait times and the crowded and chaotic counter process. Under this industry-leading admissions model, individuals will call MSRPAC’s Pet Resource Center – an empathetic staff member will conduct one-on-one phone consultations – and hear about options available beyond relinquishing their pet that may allow them to keep their pet in their home or out of the Adoption Center environment. Should an owner determine that alternative resources do not best address their situation and want to continue with the relinquishment process, they will schedule an appointment time. During their appointment, an MSRPAC team member, including an intake specialist and behavioral and medical staff members, will have a transparent conversation with the pet owner explaining their pet’s likely outcome should the pet be surrendered, which will help determine the best option for both the pet and owner. We believe that the pets, as well as the owners, will have a far less stressful exchange, and most will ultimately have a better chance of getting necessary care, adapting and finding a new home. Most importantly, Admissions by Appointment will help us save the lives of thousands of animals each year. Why did the Pet Adoption Center move to Admissions by Appointment? MSRPAC has made a commitment to save the lives of thousands of more pets. This is an exciting, yet challenging initiative that requires us to take action with a sense of urgency and move beyond the status quo. We must think outside the box and look toward innovative new programs and services that help us become the animal welfare agency of the future and save more lives. Admissions by Appointment is the next step in implementing a variety of new initiatives to help us achieve this goal. The Admissions by Appointment process has already been successfully implemented at many leading adoption centers and shelters across the country and it’s saving lives. After moving to Admissions by Appointment, these agencies have experienced a decrease in euthanasia, an increase in adoptions, and a reduction in owners surrendering their pets, ranging between 15 – 30%. The appointment process allows us to be better prepared for the number of cats and dogs that we take in. Every day, we will determine how many animals we can accept without exceeding our healthy capacity, so we can provide the safest and best possible environment for the pets in our care. Prior to and during the appointment, we will also be able to gather very specific information about the animals coming into our care so we are able to determine the best adoption plan. Our goal is to end needless euthanasia and save the lives of as many pets as we can. Admissions by Appointment will also give us the opportunity to provide additional helpful resources to individuals who desperately want to keep their pet but may be struggling so they don’t have to part ways with their loving family member. Admissions by Appointment will help us better treat our customers with compassion, transparency and respect, and ensure that we are providing each pet who comes through our doors with a healthy and loving environment that offers them their best chance for success. Most importantly, Admissions by Appointment will allow us to save the lives of thousands of more pets. How will Admissions by Appointment save lives? Admissions by Appointment will help us save lives by only taking the number of pets that we can properly and humanely serve given our available resources. If our resources are stretched too thin, we may not have the ability to provide a shy or fearful dog who needs a little extra help before going up for adoption. This can increase that dog’s length of stay, which in turn increases the likelihood that it will become ill or behaviorally unsound. In the case of cats, without Admissions by Appointment, it’s far more likely that we won’t have an open space in our often full cattery. Additionally, studies from UC Davis have shown that the longer a healthy dog or cat stays in a shelter environment, the higher the chances they become infected with a disease. How will Admissions by Appointment increase adoptions? By providing appropriate resources early in a pet’s stay, we prepare them more quickly for adoption, which reduces their length of stay. That ultimately opens up additional kennel space for more pets to more quickly reach our adoption floor and find their forever homes. Last year, 1,994 dogs and cats were adopted into loving new homes – we want to increase that number. Through an Admissions by Appointment process, we believe we can help even more pets find their forever families. How will Admissions by Appointment benefit pet owners? Admissions by Appointment will allow pet owners to receive the high-quality service and critical attention necessary to make the most informed decision about their pet’s future. Prior to their appointment, pet owners will have a private, one-on-one phone consultation with one of our trained Pet Resource Center specialists. We’ll be able to gather important information about their pets, discuss any problems they may be having and provide helpful resources that may allow pet owners to keep their four-legged companions in their homes. If the owner then determines that relinquishing their pet is the best available option, they will be able to schedule an appointment, allowing them to avoid extended wait times and the chaos that can exist when surrendering a pet through a walk-in process. During the 30-minute appointment, each pet will receive a behavior and medical evaluation, and owners will be informed of likely outcomes should they continue with the relinquishmentprocess. This transparent conversation will help owners determine what is best for both their pets and themselves. We’re confident Admissions by Appointment will help many pet owners save time, money and heartache while we save lives. What services will you offer owners who are struggling to keep their pets? By moving to an appointment process, we will be able to gather medical and behavior history for each pet prior to their arrival at our Center. We can then discuss any potential issues that may result in a pet being unsuitable for adoption and can provide resources that may allow the owner to keep the pet or other outlets that would offer the pet a better outcome. Prior to making this change, we consulted with UC Daviswho has worked with countless other agencies who have recognized the incredible benefits of Admission by Appointment. How long will you have to wait for an appointment? Wait times will vary throughout the year. Wait times will likely be longer upon the program’s initial implementation while we are still educating the public on the new appointment process. We also suspect wait times will be longer during the summer months, when we experience high intake volumes of puppies and kittens. Because we will be able to consult with pet owners and gather detailed information about each pet prior to their arrival at our shelter, we expect most appointments will last no more than 30 minutes. Admissions by Appointment. The first step is to fill out the Pet Relinquishment Form and a staff member will contact you to schedule an appointment. Will there be a fee to relinquish my pet? We do offer assistance for low-income individuals. How will you know if the system is an improvement? MSRPAC carefully tracks annual intake and adoption numbers. We will closely monitor the changes in these key indicators and will make any necessary adjustments we see fit, if necessary.